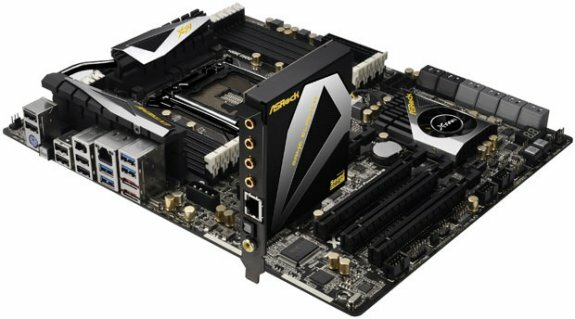 The Tech Report published details about four ASRock X79 motherboards. The top-of-the-line model is the X79 Extreme9, it has eight memory slits, five PCIe x16 slots and an add-on card with Ethernet and audio. This puppy has eight DIMM slots and five PCI Express x16 slots, although the spacing of the x16s won't allow four double-wide graphics cards to be placed side by side. 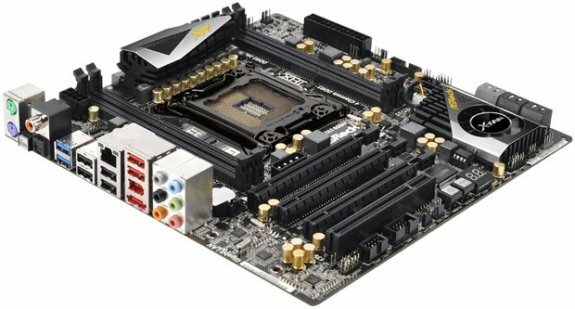 ASRock includes dual auxiliary 12V power connectors on the board, which packs an even dozen Serial ATA ports. Audio and at least some of the Extreme's network connectivity is farmed out to a PCI Express x1 expansion card that appears to be powered by Creative's new Core3D audio chip. The X79 Extreme7 model ditches the add-in card and two DIMM slots, but adds an old-school PCI slot and has some more extensive VRM cooling. Another notch down the lineup is the Extreme4, this model has four DDR3 slots and seven expansion slots, of which three are PCIe x16 slots. Another interesting model is the X79 Extreme4 M, this is basically a Micro-ATX version of the Extreme4.